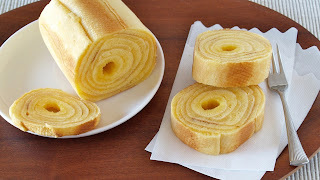 Baumkuchen is a kind of layered cake invented in Germany. It is a very popular cake in Japan. The most popular wedding favor, too! In this video, I will show you how to make it at home using a Tamagoyaki Nabe (rectangular omelet pan)! 1. Make a core tube by rolling aluminum foil. Make sure it is as wide as the pan. 2. Beat eggs in a bowl. Add sugar and mix well. Then add fresh cream and melted butter, and mix well. 3. Sift in cake flour and baking powder, and mix well. Add a few drops of vanilla extract and mix well. 4. Heat cooking oil in a Tamagoyaki Nabe (rectangular omelet pan) on low heat, pour (1/2 ladle of) the batter in the pan and spread over the surface. When bubbles appear on the surface, place the core tube coated with some oil, and start rolling (just like making Tamagoyaki). Once it has browned, set aside. 5. Again, on low heat, spread the batter over the surface of the pan. When bubbles appear on the surface, place the rolled cake, roll, and set aside. Repeat this (for 5 or 6 times) until all your batter is gone. You can coat it with icing sugar, serve with whipped cream or ice cream if desired.